What a week it has been here at Sugar Fix Dental Loft! We started off on the most exciting foot by announcing the winner of our Beverly Hills Hotel contest! We are pleased to announce that our patient, Hayley, received her gift on Monday. 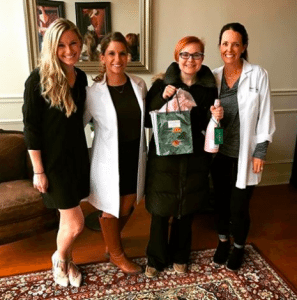 Dr. Jessica Emery, Nicole and Paxton were able to surprise her while she was in for an appointment. The Sugar Fix Team with our winner, Hayley! Haley and her plus one have received a two night stay at the Beverly Hills Hotel in Los Angeles, all expenses paid! All of us here at The Loft could not be happier or more excited for Hayley to go on this amazing trip! (we wish we could fit into her suitcase!!) A well-deserved surprise to one of our amazing patients. We had a dental filled week at The Loft as well. Our office loves to give our patients outstanding care, and we had a chance to speed up the time with Invisalign! With our awesome technology on the Cerec machine, Cerec Ortho is an amazing program that sends your digital scans straight to Invisalign, instead of goopy impressions that may take some extra days to get there. Overall, it speeds up your process! And speaking of a speedy process with Invisalign, one of our patients had their Propel treatment completed to accelerate their entire Invisalign treatment! If you’re not familiar with Propel, it is an accelerated procedure where small dental dimples are placed into your gums, and help your ligaments of your teeth move quicker with your Invisalign. It can cut your treatment IN HALF. Who wouldn’t want that!? If this sounds like something you’d like to get more information on, feel free to give our office a call at (773)-883-1818. We would be happy to explain it all for you! More exciting happenings at our place of business, Moonfish pop-up boutique is finally here! They have been setting up all day in preparation for a weekend full of socializing, shopping and sipping champagne! The event officially kicks off Saturday morning at 10 AM and will last until Monday at 6 PM with an exclusive VIP hour Saturday morning. We would LOVE if you all could join in on the fun, over here at The Loft!! 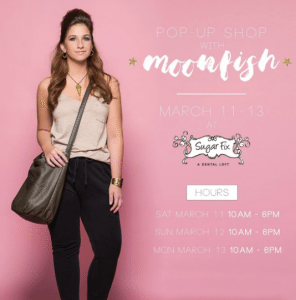 Come join us for Moonfish’s pop up shop at Sugar Fix!